Timbavati is derived from the Shangaan word for brackish water. 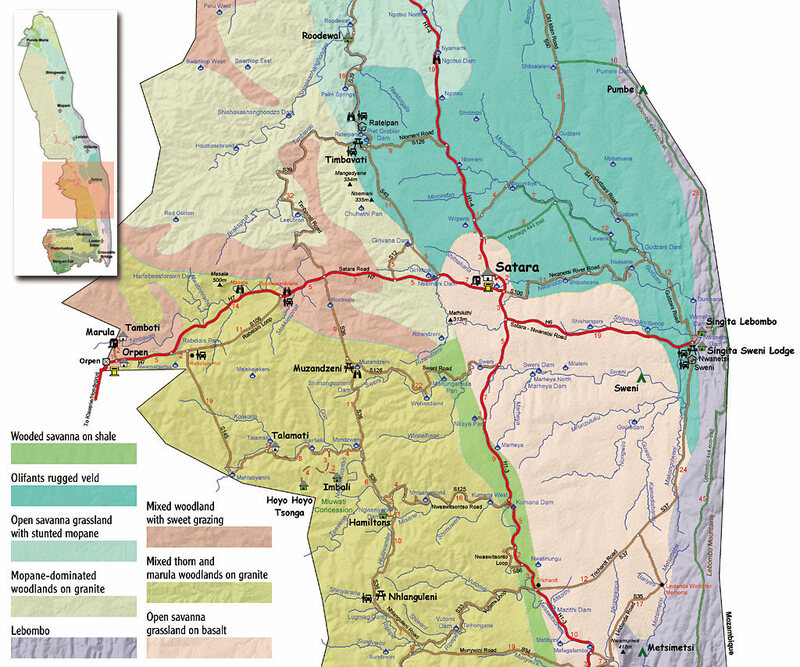 However, this tributary of the Olifants is a reliable water source for game in central western Kruger, which is why the S39 is a recommended route. There's always something happening on this road as it tracks the river for almost 50km through a variety of different geological zones and biomes. There are more Red-billed Queleas on earth than any other bird. Roberts VII estimates there are 1 500 billion birds in the world. That's about 300 million birds for every human on the planet. Unsurprisingly, there are more Red-billed Queleas in Kruger than any other species, with an estimated 33.5 million birds moving seasonally in and around the Park. They account for over 50% of the avian biomass in Kruger, moving in flocks of up to a million birds that nest en masse in acacia trees with between 50 and 3 000 nests per tree. Watching Red-billed Queleas feed is like watching the Mexican Wave at a football crowd - the birds descend in their thousands onto the ground, with the flock taking on a roller feeding movement in which the birds at the back continually hop over the ones in front to get to the food. The Red-billed Quelea is mostly a seed-eater but does eat insects, including butterflies, ants, beetles and termites. Quelea are the avian equivalent of the impala - everything feeds on them. Nesting colonies are a favourite target not only for raptors but a wide variety of birds such as the Marabou Stork, Cattle Egret, Green-backed Heron and most of the hornbills. Whole colonies of Red-billed Queleas can be devastated by predator attacks on adults, nestlings and eggs. Research at four Red-billed Quelea colonies in the Park showed predation rates of 13%, 14%, 35% and 60%, according to Roberts VII. Raptors that actively raid quelea colonies include most of the vultures, the Bateleur, African Harrier-Hawk*, Dark Chanting Goshawk and the Tawny, Wahlberg's, Lesser Spotted and Steppe Eagles, the African Hawk-Eagle, the Steppe Buzzard and Amur* and Lanner Falcons. Other animals also feed on Red-billed Quelea, including crocs that try and grab them while they're drinking, and lions and hyaenas that treat their nesting grounds as a deli. South of Timbavati Picnic Site, the road winds between thornveld and mixed bushwillow woodlands where on an average day hornbills can outnumber impala. It's interesting to note the relationship between rollers and bush-shrikes along this road - rollers are more common in the thornveld further away from the river; closer to the water, the bush-shrikes are dominant. North of Timbavati, the landscape becomes more broken as the road and river pass through Olifants rugged veld and the south-western mopaneveld. The Timbavati is a cross-over zone for birds from many habitats - and the raptors that hunt them. Regular Timbavati River Drive sightings include the Martial, Tawny, Lesser Spotted and Wahlberg's Eagles. The Bateleur is common in the combretum woodlands, while the Long-crested Eagle, which usually prefers the higher altitudes of the escarpment, sometimes comes down to the lowveld along the river. There are often flocks of noisy Green Wood-Hoopoes* and Arrow-marked Babblers cruising through the woodlands around Leeubron Water Hole, which is a good wildlife photography spot. The Olive Tree Warbler, an uncommon summer visitor to South Africa, has been seen here. It is easier to hear than see as it stays deep in the thorn thickets - its call is deep and grating, mixed with a series of gurgling notes. Timbavati Picnic Spot sits at the extreme southern tip of the Olifants rugged veld. It overlooks the reeds and sandy riverbed of the Timbavati River. Village and Lesser Masked-Weavers nest together in the trees. In winter, Blue Waxbills are common, often trying to take over weaver nests. There is a bird hide north of Timbavati on the S39 at Ratelpan that overlooks the Piet Grobler Dam, while the Roodewal and Goedgegun Water Holes are worth stopping at. The Pied Kingfisher is a busy hunter here. A curious phenomenon in wet years is to see water birds fishing at the overflow culvert at the edge of the dam wall. Marabou Stork, Grey Heron, Little Egret and Giant Kingfisher all gather for a day's fishing here, each bird perched a comfortable distance away from the other, keenly watching the cascading water for fish. Roodewal is a big, red, dolerite dyke that juts out of the lowveld floor above a well-shaded water hole. The African Fish-Eagle is often perched in the tall trees around the water's edge, while the African Hawk-Eagle and Black-chested Snake-Eagle are attracted to the rocky landscape. The rocks are part of a north-south ridge that divides the mopaneveld to the east from the mixed acacia woodland to the west. The Red-billed Hornbill appears to be the dominant hornbill along this section of the road. There is a noticeable decline in game numbers as the woodlands give way to mopaneveld. The Secretarybird is a long-legged, terrestrial bird of prey that sometimes kills its prey by stamping on it. Found mostly in open grasslands, it stalks the veld looking for lizards, rats and snakes. The Secretarybird was traditionally regarded as a bad omen by the Shangaan-speaking communities of the lowveld. If one encountered a Secretarybird during a journey, serious consideration would be given to abandoning the trip. Roodewal is a small, secluded private lodge on the Timbavati River, 44km north-west of Satara. It has a single bungalow and three cottages that sleep 19 people. The solar-powered camp is only available as a block booking. It is set among tall Ebony Jackal-berry and Natal-mahogany trees and one of its features is a large game-viewing deck suspended between huge Nyala-trees overlooking the river. Each unit also has its own viewing deck. The camp has a fully equipped communal kitchen. The Pearl-spotted Owlet is sometimes seen during the day, calling loudly as it flies between the tall trees in territorial displays around the camp. Staff report that the African Scops-Owl and African Barred-Owlet are also Roodewal regulars. During autumn and spring, the Red-capped Robin-Chat* is very vocal in the lusher woodlands around the camp. Like other robins, the Red-capped Robin-Chat* incorporates a wide variety of bird calls into its song, but it has gone a step further than its fellow songsters - it is known to mimic the yapping of a dog and mix that into its melodious song. Its completely orange head also distinguishes it from other robins, which are dark-headed. There is no shop at Roodewal and check-in must be done when entering the Park. Guided walks and drives can be booked through Satara.